Bring some holiday cheer to your breakfast with delicious and easy EGGNOG PANCAKES! My family is full of pancake lovers, and I’m always experimenting and looking for new ways to make them. These eggnog pancakes have been a big hit in our home. This eggnog pancake recipe is a twist on my fluffy pancake recipe. Big, fluffy pancakes with just the right amount of eggnog flavor. These are a fantastic way to start the day during the holiday season. And they are easy enough to even make them on a busy weekday morning. 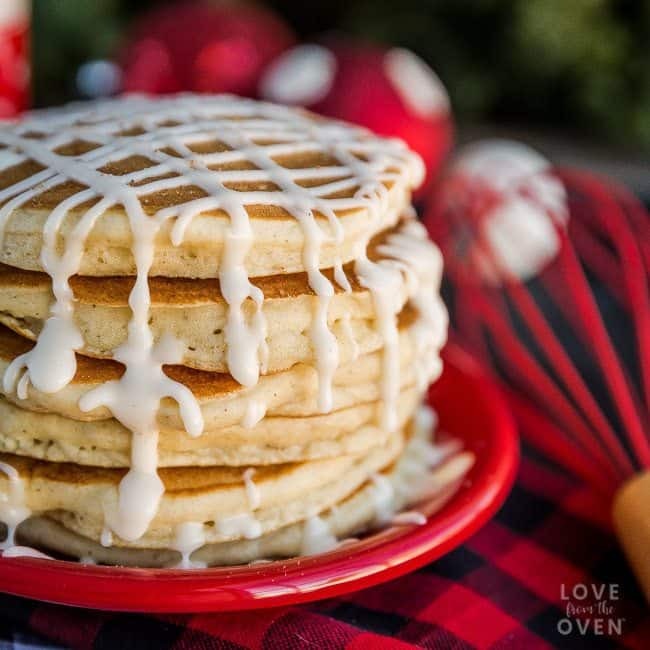 This recipe is great for eggnog lovers and those who love the flavor but have a bit of a challenge with the texture of eggnog – because this just packs that great flavor right into pancakes! These pancakes freeze very well, so don’t hesitate to make a double batch. I make pancakes once or twice a week, double the recipe, and freeze. This makes for very easy and quick breakfasts on hectic school mornings. You can top this eggnog pancake recipe however you like. 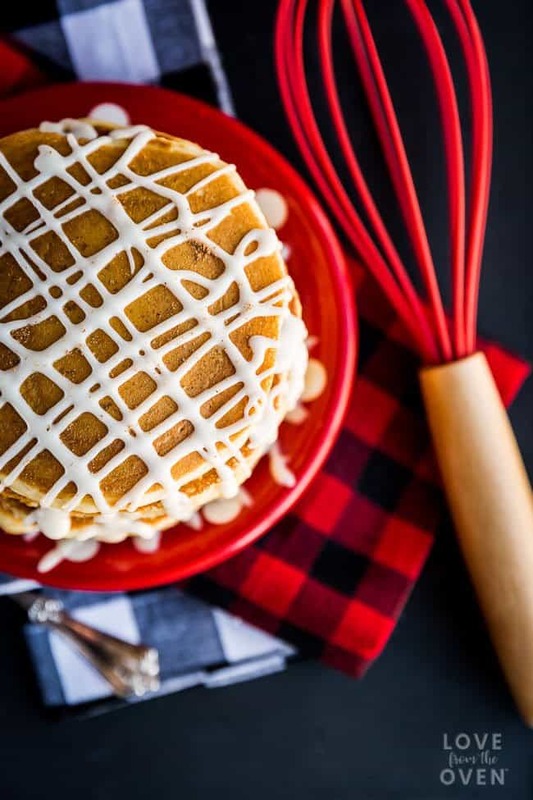 You can use butter, powdered sugar, syrup, or my daughter’s favorite, an eggnog glaze. You just can’t go wrong with the eggnog glaze option, trust me on that! These easy and delicious eggnog pancakes are a great way to start a day during the holiday season. They freeze incredibly well, so don't hesitate to make a double batch! Combine flour, baking powder, baking soda, nutmeg, salt and sugar in a bowl. Stir to combine. Add in eggnog, milk and eggs, stirring just enough to start to combine. Add in melted butter and stir just until combined. Batter will be lumpy and thick. Let batter sit for 2-3 minutes, this will allow time for the baking powder and buttermilk to help puff up the batter. Scoop approximately 1/4 cup of batter (an ice cream scoop is perfect) into a skillet that has been preheated to medium-low / medium heat (for reference I heat to 4 on a 1-10 scale) and lightly brushed with butter or oil. The batter will be thick and you will need to use your scoop or spoon to help spread the batter out a bit. When bubbles start to appear on surface and edges of pancake begin to appear to be browning, flip with a spatula and cook until golden. 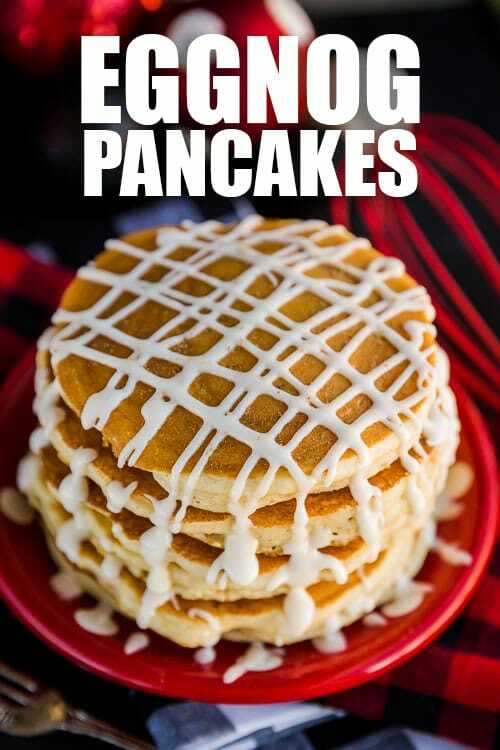 Pancakes should only be flipped once. Transfer to a plate and devour! Stir together the confectioners' sugar, salt, nutmeg and 2 tablespoons eggnog in a medium bowl until smooth. If the glaze is too thick, gradually whisk in the remaining 1 tablespoon eggnog as needed. If glaze is to thin, add more powdered sugar, one tablespoon at a time. Drizzle over pancakes and serve immediately. This recipe is flexible! It works great with whole wheat pastry flour, is deliciously hearty using white whole wheat flour. Top it with butter, powdered sugar, syrup or an eggnog glaze made from eggnog and powdered sugar. 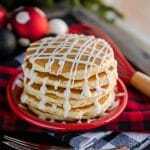 PIN THIS EGGNOG PANCAKE RECIPE TO SAVE!